A vitamin for memory and exercise may improve mental clarity, enhance memory, and improve mental sharpness and preserve your quality of life. Brain vitamins may help. Research has shown that taking a vitamin for memory combined with exercise and some supplements can have a beneficial effects on the brain. In a study reported in the British Journal of Psychology in 1990, Phosphatidylserine or (PS) was shown to significantly increase name and face association. Evidence has also mounted to suggest that physical and mental exercise may work with PS to make forgetfulness – such as drawing a blank when trying to associate a name with a face – a thing of the past. As noted elsewhere on Memory Loss Facts, physical exercise has great benefit for the brain. For example, a 2004 study in the Journal of the American Medical Association (JAMA) revealed that walking as a form of physical exercise increased mental functioning in older women. Vitamins for Memory - Do they help? Mental exercises stimulate neural development and reinforce older connections in the brain. This preserves brain fitness and enhances memory. Mental exercises can be programmed such as brain fitness software or a brain game can be playing card games, reading, learning a musical instrument or completing crossword puzzles. 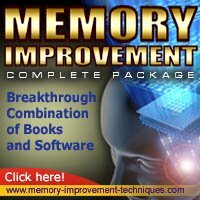 As we have discussed elsewhere on Memory Loss Facts, here are really two larger issues involved with memory vitamins or supplements for memory loss. First, certain vitamin deficiencies can actually cause memory loss. These include Vitamin B12 Deficiency and Thiamine Deficiency. Second, there is some evidence that certain supplements or vitamins can improve cognitive or memory performance. Another vitamin for memory might include PS, DMAE, Acetyl L-carnitine or others. Thus, good nutrition, mental and physical exercise, stress reduction and as appropriate supplementation can be important ingredients in overall brain health and memory preservation. Some brain researchers believe that combining physical and mental exercises can really boost the brains power. Thus, engaging in the above activities together may actually be more powerful. The idea is that you are incorporating thinking and mental activity with exercise.